Pumpkin pie with coconut milk. 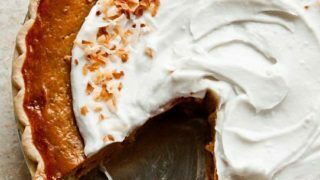 You will love this fun twist on pumpkin pie: orange spice pumpkin pie made with coconut milk instead of evaporated milk. Plus, a touch of fresh orange zest in the filling and coconut whipped cream on top. Today, I broke the law. I made you a full size pie. A pie that serves 8 to 10 people. I know, I know. But, it’s Thanksgiving and I’m sure you have more than two to serve. 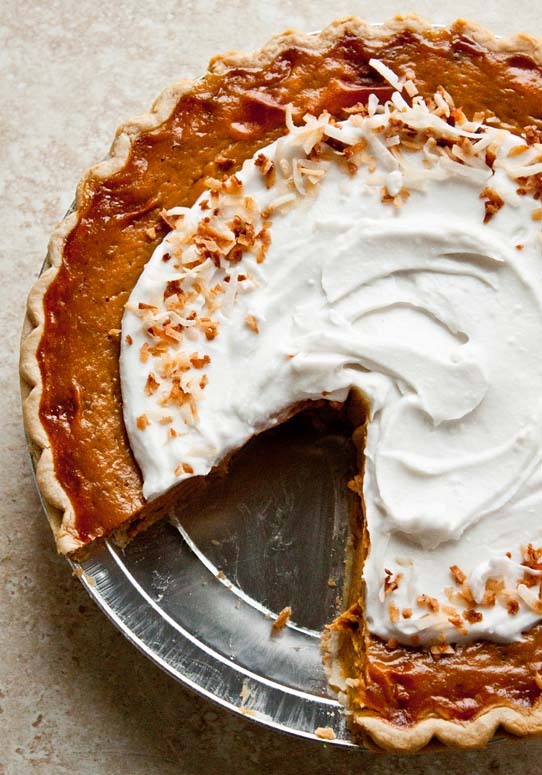 This pumpkin pie with coconut milk is too good! But if you are serving just two, I got you covered: I made a Thanksgiving dessert for two roundup last year here. This pie, y’all. Oh, this pie. I took the famous Libby’s pumpkin pie recipe (the one made with evaporated milk) and substituted coconut milk. Then, I added orange zest along with the usual suspects of cinnamon, cloves and ginger. Then, here’s where it gets good: I made coconut whipped cream. I bought this teeny, tiny can of solid coconut cream, chilled it, and then whipped it. I ate half of it right out of the bowl (which is why it doesn’t spread all the way to the edge). Sorry I’m not sorry. I found this tiny can of solid coconut cream at Whole Foods, but look for it in the baking aisle of your store. You could also take a regular size can of full-fat coconut milk, chill it upside down, and scrape the solid fat off the top. I haven’t had great luck with that method, but my friends have. Best of luck! For me, the only fail-proof way is to only buy the coconut cream in the can. But hey, use regular whipped cream with coconut extract if you’re not up for it. You have plenty of other things to cook on Turkey Day. I just want to be very clear here: this recipe calls for a pre-made frozen pie crust, but it MUST BE DEEP DISH. When I first published this recipe, I didn’t mention that it was a deep dish pie crust. Many apologies for this. My Mom only ever bought frozen deep-dish pie crusts when I was growing up, and I didn’t realize until recently that they sell regular pie crusts! I received a few comments from people that the pie over-flowed their dish, and that would be why–you need to use a deep dish pie crust. I use the Pillsbury one, and it works perfectly every time. Seriously, I’ve made this deep dish pumpkin pie with coconut milk 5 years in a row, plus it made it through several rounds of recipe testing. One final tip: when you’re using the coconut milk, it is not the whole can. It’s only 12 ounces, or 1 3/4 cup. Make sure the coconut milk is room temperature, and give it a good shake to dissolve any fat globules. You can slightly warm it if you need to in order to make it perfectly smooth before adding it to the bowl. Why, I believe I WILL faceplant into this. It would probably be the happiest faceplant of my life. That looks/sounds simply divine. I am going to give it a try as I love anything with coconut. What a fun twist to the traditional pumpkin pie. Oh dear gaaaaaaah! 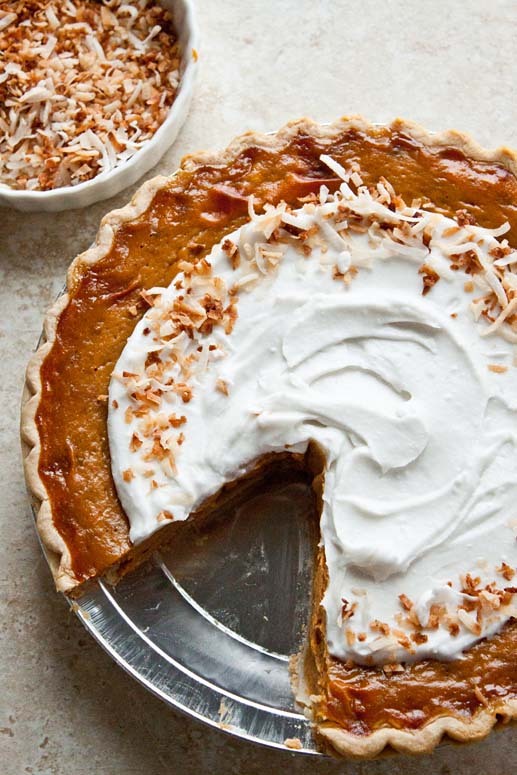 I love using coconut milk in pies – this really is an ultra amazing pumpkin pie – rest assured I will be having a coconuty orangy pumpkiny pie for thanksgiving! ALL THESE GIVEAWAYS are so awesome! Thanks lady! Ahh…I agree with Joanne! I will just need to face plant into this gorgeous pie! This looks amazing Christina, I’ll be trying this recipe for sure! Happy Thanksgiving. The flavors of this sound amazing! Seriously going to need to try this. Coconut whipped cream is my new favorite, probably because I feel like it must be so much healthier than regular whipped cream despite have the words “full fat” in the title. Ha! How have I never whipped coconut cream?!? I’m making myself a note to do that RIGHT NOW. I love this Christina! I have been looking for a new take on classic pumpkin pie for my Thanksgiving dessert spread and I think this is the one! My Dad loves coconut so he’ll be thrilled. I love coconut whipped cream too- genius! This is beautiful Christina! Love the addition of orange zest and substituting coconut milk for the evaporated. And, and, and!! The coconut whipped cream on top. Just love it all. I’m just going to sit back and stare at this pie awkwardly and start to drool. Don’t mind me. You’ve totally managed to make this pie the new NUMBER 1 on my Must Make Pie List! Yes, the list does exist. The coconut milk and the pumpkin and the spices…swoon! This is such a neat flavour!! Yum! Oh, Lisa, thank you so much! I’m a bonehead! I’ve updated it now. It’s the zest of half of an orange. I do think this pie would travel well, with the whipped cream separate. Put it in the fridge as soon as you get there, though. Safe travels! Oh my this pie is friggen gorgeous! I love the coconut and orange additions! Brilliant. This is such a pretty pie! I would have never thought of coconut and pumpkin together. Wowza, lady! You sure know how to dress up a pumpkin pie! I am going to have to try this! This pie is beautiful and sounds amazing! Mmm, sounds delicious! My husband and I are on pie duty every year, since we grow our own pie pumpkins. Love the twist with the coconut milk and coconut whipped cream… yum! Could this pie be any more perfect?! I love this twist on the traditional pumpkin pie! What a great idea! I love the coconut substitution. Such a great flavor kick! Oh hiiiiiiiii there! Just here to say I’M OBSESSED WITH THIS PIE!!! We love pumpkin pie anyway. Actually I love everything pumpkin. This pie is different , and I can’t wait to make it. I predict a hit! Hi- We tried this recipe last night in advance of Thanksgiving and I’m glad we did. It’s very similar to Ina Garten’s pumpkin pie recipe minus the rum and cream. The orange flavor is delicious but the pie never set. When I retraced our steps this morning after the pie sat in the fridge all night I realized what had happened. Above you show a picture of the ingredients with a Thai Kitchen can of coconut milk, which is what we used. However your recipe calls for a 12 oz can- and their cans are sized 13.66 oz (per what we got yesterday at Whole Foods) or 14 oz (as pictured on their website). Even though they stand the same height as a 15 oz can of pumpkin, like your picture also shows, it’s not the amount you specify in the recipe and this should be emphasized. In this way people need to pour off some of the coconut milk from their can to get the smaller amount specified in the recipe. Makes sense since most recipes using a full can of condensed milk or heavy cream use less liquid- and it’s thicker than the coconut milk. 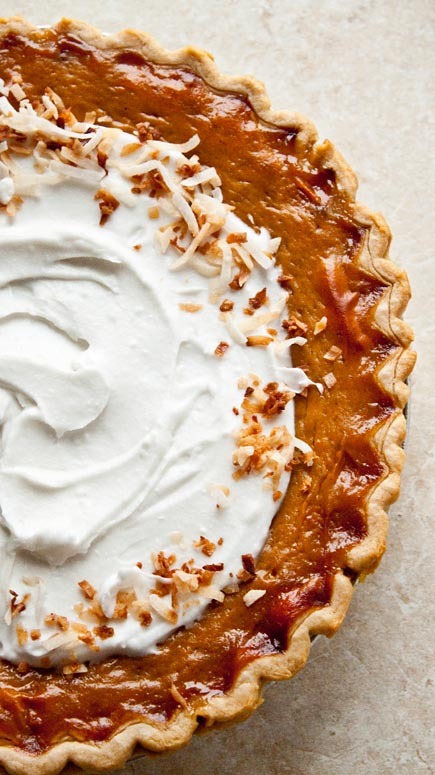 We will try this again for Thanksgiving because the flavors were great- but use less coconut milk- probably less than even the 12 oz in the recipe- because what we have right now is a thinner version of pumpkin coconut mousse in a crust. Can only spoon it out! First, thanks so much for writing me. And second, I am so sorry! I am so glad you tested the recipe before your Thanksgiving celebration! I would be mortified if I ruined your pumpkin pie expectations. I’m still mortified that this recipe did not work for you. 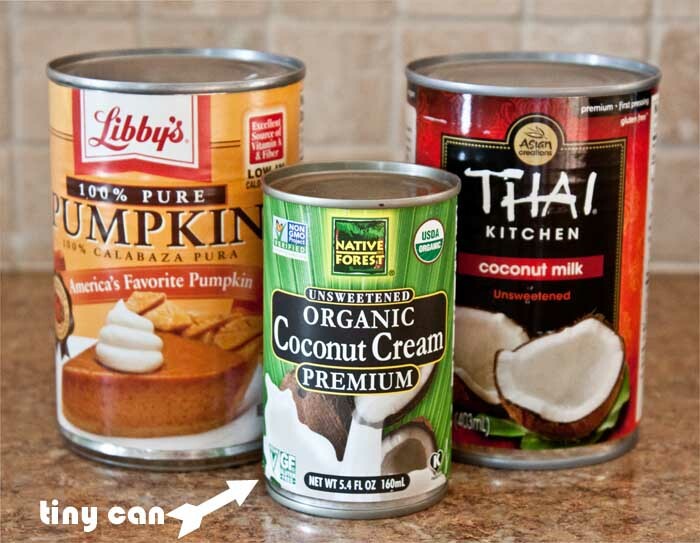 Let’s see…hmm..I made this recipe last year, and I do remember using the entire can of coconut milk that you see pictured. I am racking my brain to figure out why it didn’t work for you. Is there any chance your eggs were smaller than large? The eggs should set the custard. Did you measure the sugar very well? Sugar is a liquid ingredient and can be blamed for things ‘not setting’ sometimes. What about pie pan size? Did you happen to use a deep dish pie dish? That would alter the baking time. When you pulled it from the oven, did it only jiggle slightly in the middle? I’m wondering if you under baked? I just have no idea! I’m so so sorry, though. I’m going to make this pie again this year and see if I have any problems. I made it twice last year before posting it. Thanks for writing, and best of luck! Hi Christina- Just seeing this as I returned to your website to make it again for tomorrow. It really was delicious even though it was soft. I happily ate it for breakfast with whipped cream each day til it was gone :). I think it was the discrepancy in coconut milk size. (Actually baked it close to an hour because it wasn’t setting, and had so much extra filling I made 3 cupcakes too). Thai Kitchen may have just changed their can size this year as the ounces vary (within 1-2 oz) online when you look at the product. I will pour a small amount of the coconut milk off in favor of the thicker cream. I’m sure it will be scrumptious. Thanks for a great recipe! Whoops- just to clarify baked the 350 degree portion for about an hour; typically our oven is spot on with the lower time recommendation for recipes so I’m sure it was just the extra liquid! Pie was a HUUUUUUGE hit last night! Planning our Thanksgiving dinner, and I keep coming back to this! My husband is a pumpkin pie purist, but kicked up ginger and orange zest are SO my jam. I may try it with heavy cream instead of coconut milk first to ease him into it. I made this for thanksgiving this year and it was. AMAZING. I don’t even like pumpkin pie! I do love pumpkin, and coconut milk, and coconut cream… so I just had to try it and I’m so happy I did! Thanks for another great recipe!